BOOM! Town, an imprint of award-winning publisher BOOM! 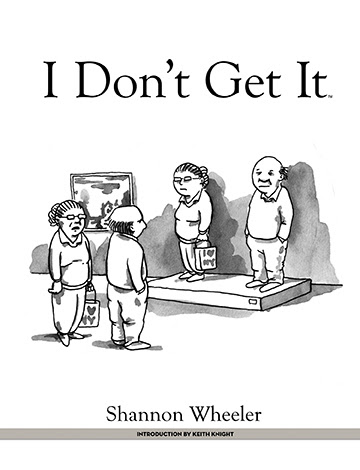 Studios, is excited to announce the January 22nd release of I DON’T GET IT, a follow-up hardcover collection to Shannon Wheeler’s I TOLD YOU SO and Eisner Award-winning I THOUGHT YOU WOULD BE FUNNIER books. As with the previous two volumes, I DON’T GET IT is a “best of” collection of cartoons Wheeler created for The New Yorker that were not accepted for publication. The New Yorker is a weekly magazine containing articles, short stories, and essays that focus on the cultural life of New York City. Where do cartoons go when they’ve been bounced by The New Yorker? When they’re as funny as what’s floating in TOO MUCH COFFEE MAN creator Shannon Wheeler’s brain, they’re boiled down to the best of the bounced and presented in one laugh-out-loud volume. Featuring an introduction by Keith Knight (THE K CHRONICLES, THE KNIGHT LIFE), I DON’T GET IT is the latest collection of wheeler cartoons that will leave you wondering why they never made it to publication. I DON’T GET IT arrives in comic shops on January 22nd with a cover price of $17.99 under Diamond order code NOV130881. Not sure where to find your nearest comic retailer? Use comicshoplocator.com or findacomicshop.com to find one! It’s also available for order directly from boom-studios.com.